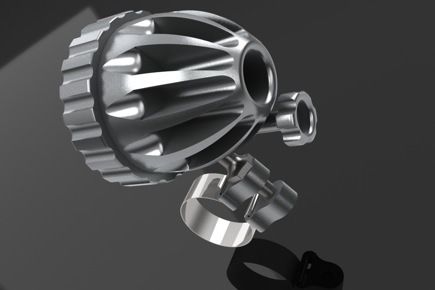 In order to take advantage of my access to the Laney College CNC machine shop over the summer while there are no classes in session I designed a bike headlight to be made out of Aluminum, in collaboration with my electrical engineer friend Cuyler. He’s already designed a CC/CV boost drive/BMS circuit for a 2S Lithium battery pack driven, dual MC-E light- but didn’t have a light to build it in. 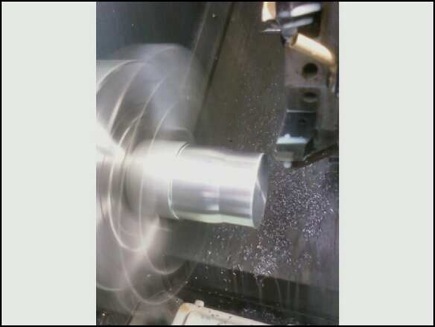 I thought I could fill that void, while making a really interesting design and machining challenge. 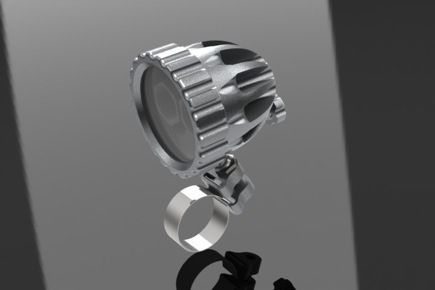 The design incorporates mounting, heatsinking and weather protection for 2x “star” style LEDs, and <25mm optics. I’ve been working in the shop two nights a week for the last several weeks, so far working on the NC-lathe cut blank for the main light body. I’m expecting things to pick up once I get on the mill, I’m a lot more practiced with set up and programming for it. 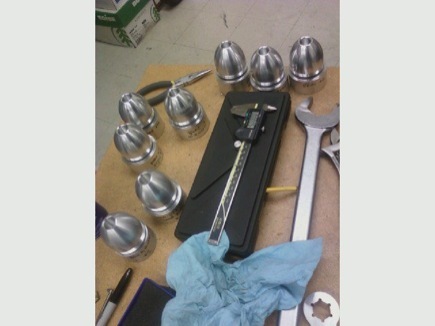 Last night I finally got the first lathe operation dialed in, with size and finish tolerances all checking out OK. I was unable to find a positive CNMG432 insert in the shop that might have been able to curl and break the chip during the finishing of the OD- I was having trouble with stringy chips wrapping around the part and scarring it. I have it set now to take a “rough finish” cut at .01 feed per rev, then take a .002 deep final finish cut at .002/rev- the chips become long and stringy but aren’t substantial enough to mark the part in the presence of the flood coolant. I consider that operation “ready to go” now and have about 12 blanks precut- next time I get a chance I’ll run those parts and start setting up soft-jaws in the mill for the 3 remaining mill operations on that part. There’s at least two operations for each of the seven parts in the assembly-I need to make some quicker progress if I hope to finish before school starts! But at least it’s most all aluminum, which should be fast and easy once I get on the mill where I’m comfortable.